Optigo Connect is an innovative family of networking hardware products capable of connecting thousands of smart devices anywhere on the property with a fraction of the infrastructure of traditional hardware. Implementing IoT in a new building or retrofitting old buildings with smart devices can be complicated projects that require large capital investments and specialized knowledge. Optigo Connect products are engineered to save you time and money without sacrificing security or long-term scalability. At Torre Diana, Optigo ConnectTM saved 90% in cabling and unified the network management of more than 500 IP security cameras, elevators and building automation devices. Optigo Connect provides OEMs an easy and cost-efficient way to fill a gap in current building automation and security product offerings. Optigo Connect helps integrators deliver building IoT solutions on spec, on time, and on budget so that they can increase their profit margins while reducing their headaches. Optigo Connect helps building managers increase confidence that everything is always working to keep their commercial building secure and comfortable. 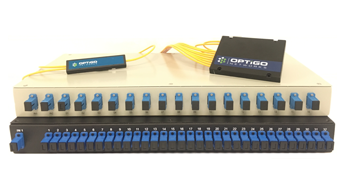 Simply plug your Edge Switches into your Optigo network and our plug-and-play technology will do the rest, allowing for quick and easy installation and provisioning. Connect your IP devices across large distances, while maintaining network management from a single location for control and monitoring. Visibility throughout a building network is crucial for systems with hundreds to thousands of devices. With a radius of up to 20km (12.5 miles) from the Smart Aggregation Switch, your network can now reach wherever you need to go. The Optigo Connect solution works for networks of any size, from just a few to hundreds or thousands of IP devices. Adding devices is effortless with our split fiber technology. Our solutions require less equipment, less space and less cabling than traditional solutions, saving you labour costs and money. Our management software makes provisioning effortless. Our networks are more flexible and contain fewer active components, which decreases the number of potential failure points in the network. A typical network consists of one Smart Aggregation Switch, several Optical Splitters and multiple Edge Switches. Optigo Networks offers several types of each of these devices, to help create the perfect solution for your application. With Optigo Connect, the network is now flexible and strong, able to support a multitude of systems with ease and performing better than ever. Our versatile line of managed Edge Switches are engineered to meet any challenge in building automation and security. With various size, mounting and environmental options, our switches can be installed anywhere from a control room to a utility pole. All PoE and VLAN settings are centrally managed from Optigo’s OneView superscript Dashboard, allowing complete monitoring and control from one comfortable location. Our management interface, the Network Controller with Optigo OneView, allows you to manage your entire network from one place. Quickly and easily see the status of your ports, know how much bandwidth you are using, and configure VLANs. OneClick Secure allows you to close all open ports and lock used ports to the applicable MAC address with the click of a button. Optigo OneView gives you unique visibility into your building network. Our Smart Aggregation Switch is designed specifically for deploying passive optical networking in intelligent buildings. 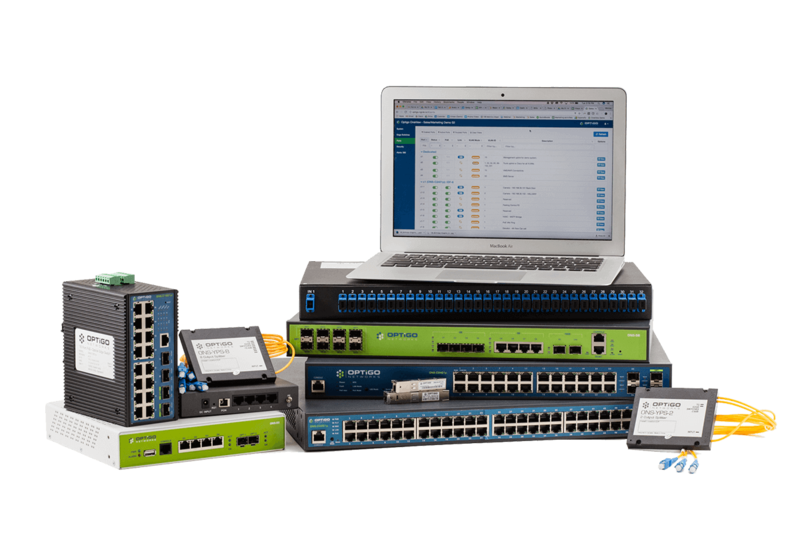 It allows you to create a single virtual switch with up to 1028 distributed ports, and centrally monitor and manage your entire network with a built-in OneView Dashboard. Our Smart Aggregation Switch supports all protocols in use for security and building automation, and easily achieves redundancy with its auto-switching Active/Standby feature. Our Passive Optical Splitters allow you to optimize the cabling throughout your intelligent building. Simply run a single fiber and split it wherever you need – without the use of power, climate control or maintenance. A wide selection of splitters enables a variety of flexible and expandable architectures, enabling your network to reach up to 20km (12.5 miles) while reducing cabling costs up to 80%.